For additional information about this book, visit the website TheLegendofRanger.com. Ranger always wanted to be like his big brother and be part of the reindeer team that pulled Santa and his sleigh on their annual Christmas eve journey. But there was one big problem: Ranger couldn’t fly! (Which explains why, even though he was Rudolph’s younger brother, few outside of Santaland ever heard of Ranger.) 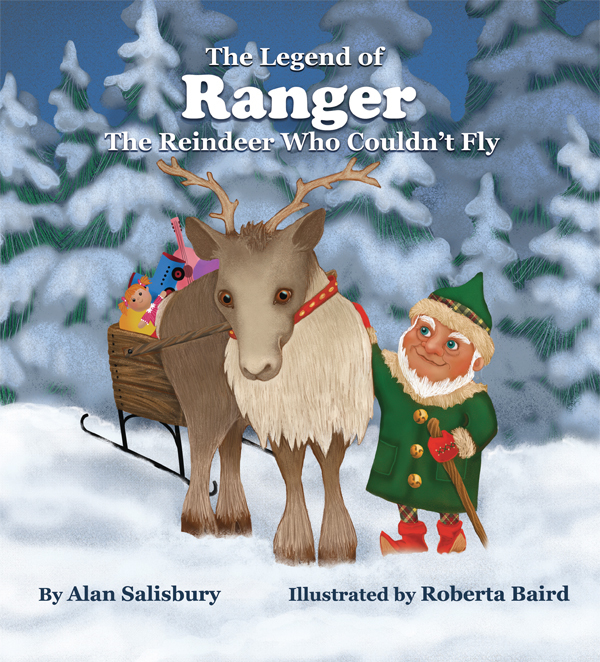 Our story begins as Ranger confides to his friend Carlanna, the young daughter of a toymaker elf, that this year he is determined to learn to fly. Alas, his quest to learn the secret of flying meets with nothing but frustration. So Ranger continues with his important job of hauling newly made toys from the workshop to the warehouse. As Christmas draws near, several reindeer are suddenly taken sick and the outlook for Christmas is in doubt. Ranger is sent with Zarvett, the reindeer keeper elf, on a mission to bring back the needed medicine. But the journey is long and perilous, with as yet unknown crises ahead. Will they succeed? Alan Salisbury is now embarked on a third career as a philanthropic writer and game developer. A retired Army general, he spent another 12 years as an IT executive and consultant. While his redirection into writing children's literature, games and even songs seems like a wild departure from his earlier work, he comes by this new interest honestly, having a mother who dabbled in poetry and songwriting, and a wife who had been a school teacher with a strong interest in children's literature. He has previously published a successful board game and a computer design reference book along with many articles and technical papers. With his first children's book now in the publishing process, he already has a second book and a new board game in process, all to benefit selected charities.